Dark Arts | Expecto Patronum! The hilltop faded and Harry stood in Dumbledore’s office, and something was making a terrible sound, like a wounded animal. Snape was slumped forward in a chair and Dumbledore was standing over him, looking grim. After a moment or two, Snape raised his face, and he looked like a man who had lived a hundred years of misery since leaving the wild hilltop. This scene probably takes place about a day after the opening of the first book. Dumbledore has already delivered Harry to the Dursleys, and has presumably joined in the celebrations following Voldemort’s fall. But for Severus Snape, there can be no celebration. This is a delicate moment in Snape’s story. The consequences he tried to escape by turning to Dumbledore in the first place have now hit him full in the face. He is already at Hogwarts, already a spy, already starting to turn his life around. But now disaster strikes. Lily is dead. He sounds like a wounded animal, and Dumbledore looks grim. If Dumbledore mishandles the scene now unfolding in his office, Snape can be lost forever. But Dumbledore knows his man. When Snape tries to blame Dumbledore for not protecting Lily sufficiently, Dumbledore – correctly – throws it right back at him, making Lily’s death a question of choices, not his personal omnipotence or lack thereof. As always, our choices define us. James and Lily made a bad choice. Severus made a bad choice. At the point where those two sets of bad choices intersect, Lily Evans died. In that corner of the Potterverse, Dumbledore is a master manipulator who has zero concern for any other person, just so long as he gets what he wants. He manipulates Severus into doing his will, manipulates Potter into doing his will, and it matters little to him what damage he causes in the process. It’s a view that listens only to Aberforth’s bitterness (and Snape’s complaint that Dumbledore used him) – and listens not at all to Dumbledore in King’s Cross. In short, Dumbledore is a bit of a sociopath. Any tears he may have shed or self-doubts he may have expressed over his failings are irrelevant, as are any conclusions Harry ultimately draws. Dumbledore, in these fans’ view, is only about lies and manipulation. [Dumbledore and Snape] both had felt the temptation of the Dark Arts; Snape followed that path much farther than Dumbledore did before realizing the terrible price such magic exacts, but they both were, in a sense, recovering addicts. I think that, as much as Snape’s deep love for Lily, was the reason for Dumbledore’s unwavering trust in him. Bellatrix: While I endured the dementors, you remained at Hogwarts, comfortably playing Dumbledore’s pet! Snape: Not quite. He wouldn’t give me the Defense Against the Dark Arts job, you know. Seemed to think it might, ah, bring about a relapse… tempt me into my old ways. Snape uses precisely the language of addiction and recovery. If we tease out the analogy for the scene in Dumbledore’s office, Snape is newly recovering from his fall into the Dark Arts, while Dumbledore has had a much, much longer period of recovery. And like a newly recovering addict’s counselor, Dumbledore does not gloss over attitudes that could cause Snape a relapse… or worse, drive him to suicide. Instead, he has the unmitigated gall to call Snape on them! He again uses tough love. When Dumbledore tells Snape the single piece of good news in this tragedy – that the boy lives – Snape treats the news as if it’s an “irksome fly.” He appears to regard the boy as an usurper, alive while Lily is dead. It is precisely at this point that Dumbledore draws Snape’s attention to the fact that the boy is not an insect to be brushed off. He is a child, Lily’s child. He has precisely her eyes. Dumbledore is not callously taunting Snape. He’s acting as a conscience, putting a human face on Harry for Snape, a human face that Snape needs to see. Significantly, at the end of his long and perilous journey, Snape finally will acknowledge, in his last breath, that the boy does indeed have Lily’s eyes. At times, drinkingcocoa’s LiveJournal mirrors my own thoughts on Severus Snape. Many of the insights contained in her post “Why Dumbledore delegated the final message to Snape” are exactly the same as mine. But then there’s her insistence that Dumbledore never cared for Snape. And there we differ. Big time. This is a recurring theme for drinkingcocoa (and I daresay many Snape partisans), so I’m starting a series that examines the Dumbledore/Snape interactions. At the Terminus roundtable “I’m Not Dead Yet,” for those of us still in Snape-death denial, moderator Lori A. Franklin asked us if anything in the chapter “The Prince’s Tale” surprised us. My answer was that I was shocked to see that Dumbledore didn’t love Snape. His “You disgust me” may be the harshest thing he says to anyone in the series. Dumbledore talks like that? There’s a name for what Dumbledore does here. It’s called “tough love.” Dumbledore speaks harshly to Snape precisely because he respects him enough to tell him the truth. Dumbledore’s disgust is based on Snape’s behavior, not his person. He does not eternally condemn Snape to the category “disgusting.” Rather, he merely refuses to coddle Snape, refuses to woobify him. Why ask for more when everything we know about Dumbledore indicates that he would hardly shirk the responsibility of protecting the Potters, regardless of Snape’s response? Because pushing Snape to make a commitment affords the Death Eater an opportunity to truly turn his life around, to change, to repent, to make restitution, to be redeemed – just as Dumbledore turned his own life around at about the same age. And the prodding works. It is the barest of beginnings, but when Snape says he’ll do “Anything,” it truly marks the difference between certain damnation and the possibility of redemption. Rather than showing coldness or lack of care, Dumbledore’s rough prodding actually shows the depth of his concern for Snape’s soul. I had assumed that Dumbledore loved Snape…, the man whom he utterly trusted, and mentored away from a damned life, and guided through the trickiest of double agencies. How fascinating to learn that this was wrong, and that Dumbledore saw Snape only as an unusually valuable indentured servant. “An unusually valuable indentured servant”? An indentured servant is under contract to perform a service for a period of time. There is no such relationship between Dumbledore and Snape. Snape did not have to go on staff at Hogwarts. He did not have to work so hard to protect Lily’s son. He did not have to spy for Dumbledore. He did not have to work to redeem himself. He did not even have to commit to killing Albus Dumbledore. He always had a choice. He could have slithered away into the darkness and Dumbledore would never have forced him to return to the light. That much is evident from their conversation during the Yule Ball, when Snape tells Dumbledore that the Dark Mark is growing stronger and Karkaroff plans to flee. Dumbledore asks Snape if he too is tempted to flee, indicating clearly that he has no intention of forcing Snape to remain if Snape wishes to save himself. But Snape is “not such a coward.” And he is no indentured servant either. He voluntarily works toward redeeming himself under the guidance of a very tough spiritual mentor who gives him the opportunity to make free moral choices. And Dumbledore is uniquely qualified for this role. He knows more about the lure of the Dark Arts than Severus Snape can possibly imagine. [p. 689] …could ever have been friends with Gellert Grindelwald. I think her mind’s going, personally! Snape pockets the second page of the letter with Lily’s signature, then takes the photo of Harry’s family enclosed in the letter, rips it in two, and keeps only the picture of Lily. The scene is simultaneously touching and maddening – reaffirming Snape’s love for Lily and his disdain for her loved ones at the same time. On the one hand, the man who prides himself on being strong enough to shut down emotions can weep his losses. On the other, ripping the photo and tossing the half showing Harry zooming around on his toy broomstick is a callous act… as is pocketing Lily’s part of the photo and her signature on the letter. Snape is depriving Lily’s son of what rightfully belongs to him. It is Snape at his most distraught, and his most selfish, since the terrible events of 1981. But what’s going on here emotionally? Dumbledore is dead. Snape saw to that. Lily’s son, the boy Snape has protected all these years at great personal peril, has just called him a coward. Aside from some future help from the Headmaster’s portrait, Snape is now on his own. And as we see, he is grieved – so grieved that the memory appears out of order in the Pensieve. The two people who cared about him most are gone, and he’s left to infiltrate the darkness to carry on the battle alone. And what is in the letter he is reading? Remarks about Dumbledore, the man Snape never wanted to kill – remarks connecting Dumbledore to the Dark Arts and the subservience of Muggles to Wizards, via the Headmaster’s connection to the great Dark Wizard Gellert Grindelwald. And no, Bathilda Bagshot’s mind is not going… at least not yet. Ironically, the consequences of Snape’s own youthful attraction to the Dark Arts and Muggle subservience have brought him to this place. Alone. Unloved. Hated. But did Snape ever know Dumbledore’s past any better than Harry did? Did he know that Dumbledore was not inherently more virtuous than he himself? Did he know of Dumbledore’s youthful desire for the Deathly Hallows and for power? Did he know that Dumbledore had been inflamed by the ideas of the most dangerous Dark Wizard of all time, before Voldemort? All of that is doubtful, given that Dumbledore never even told Snape in what way he was tempted by the cursed ring. So why is Snape weeping? For Lily only? Maybe a little for Dumbledore… and for what he never knew about the Headmaster? For the path he himself must take over the next year (or however long it takes to bring Voldemort down)? Whatever the case, it is refreshing to know that there were times when even Severus Snape wept. In a more fairy tale rendering, the two halves of the letter and the two halves of the photo might have acted like half lockets to draw their possessors together. But even had he wanted to, Snape could never have openly embraced the boy. That would have compromised the mission he accepted after Lily’s death. As Ministry of Magic so aptly puts it: “Sometimes consequences define your life with hardship.” Snape all these years later is still reaping consequences manifold. Paraphrase: Snape is no hero because he only protected Harry out of devotion to Harry’s mother, with whom he never had a romantic relationship. I think my friend is missing a major point. Lily was apparently the first magic person his own age that Severus ever had any contact with. The excitement in meeting Lily is more than a schoolboy crush. It’s a revelation. Finally, here’s another kid who’s like him. He isn’t just a freak, as his muggle father apparently believed. Here’s a lovely innocent girl who can also do wandless magic. Severus was a lonely, isolated boy – a boy that Harry ultimately considers (along with himself and Tom Riddle) to be one of the “abandoned boys” who found a home at Hogwarts. For Severus, becoming friends with Lily before he ever went to Hogwarts was a way to escape, however briefly, the hell of his hovel in Spinner’s End. At this point, he’s already angry about his muggle father’s abuse, and he lashes out at Petunia. But there’s a real innocence and excitement in his childhood conversations with Lily. If he had been sorted into Gryffindor (where Dumbledore hints he probably belonged) rather than into Slytherin (apparently his pure-blood mother’s house), his life would have been quite different, and his relationship with Lily might have grown in a more healthy direction. Instead, he falls under the pernicious influence of Lucius Malfoy, his Slytherin prefect. 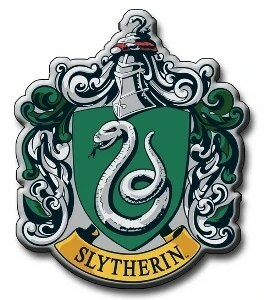 Now mind you, I’m not Slytherin-bashing. There’s plenty of evidence that good can come out of Slytherin. Witness Snape himself, whom I maintain is one of the three great redemptive heroes in the story. But in 1971, when Snape entered Hogwarts, the house had become a recruiting ground for Voldemort, and young Severus lost his way. Paraphrase: Snape’s love for Lily is disturbing, obsessive, pathetic, almost John Hinckley-ish. He should have outgrown his Lily obsession years ago. Again, I think my friend is missing a major point. Snape’s bad choices brought about Lily’s death. How can he outgrow that in a mere 16 years? The information that we learn about Dumbledore in the final book is, I think, crucial to understanding Snape. In fact, it is probably this knowledge of Dumbledore’s past that makes Harry finally able to forgive his former antagonist. Snape is consumed with a guilt for which he is doing a lifelong penance – just as Dumbledore is. The difference is that Snape never has the opportunity to travel nearly as far on the road of redemption and conversion as Dumbledore does. We never get to see what he could have become had he lived. What, I wonder, was Dumbledore like 10-16 years after the death of his sister? Was he as outwardly genial then as he appears now, nearly 100 years later? Or was he more outwardly haunted, tormented by what he had done? Different personalities, different manifestations of guilt, perhaps. But it’s highly likely that Dumbledore sees himself and the tragedy of his own error in Snape. It’s not for nothing that he likes to give people second chances. 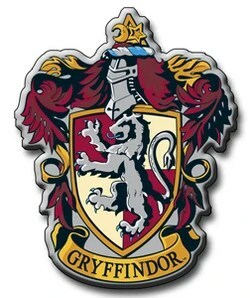 Snape is the rare – possibly the only – Slytherin who can carry the sword of Gryffindor. He is also, according to Rowling, the only person bearing the Dark Mark who can produce a Patronus. That in itself is a testament to the depth of his repentance. He’s not a nice man. Neither was St. Jerome. But he grows tremendously from the night he first begs Dumbledore to protect Lily, swearing that he will do “anything,” to the night he pours out his blood and finally gives his memories to Harry Potter. I think there is another, even more crucial, point that my friend is missing. For 15 years, Snape believed that the mission was to protect Lily’s son. But then he learns that the real mission is much bigger. Yet Snape continues with the mission over the next year – thanklessly sacrificing Dumbledore to save Draco, infiltrating deeper into Voldemort’s ranks to become Voldemort’s right-hand man, and doing what he can to protect the students of Hogwarts from the Death Eaters – all while believing that Lily’s son will finally have to die to save the world from Lord Voldemort. He could not deliver the message of sacrifice to Lily’s son simply for love of Lily. He could only do that for something much bigger than his own selfish unrequited love. 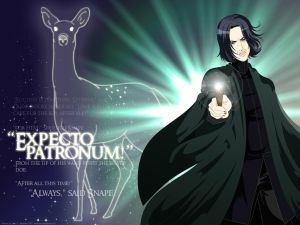 Snape produces the doe Patronus for Dumbledore approximately one year before his own death. And he can still produce a Patronus after becoming Voldemort’s hand-picked headmaster. By continuing to produce the Patronus, Snape shows that his soul remains unripped by the horrors his double agent role have forced on him. Frankly, I see his Patronus less as a sign of obsessive love than as a desire to return to the childhood innocence he possessed before becoming so horribly corrupted by the Death Eater ideology. His Patronus is a manifestation of the best of him. Unlike my friend, I count Snape a true hero and believe that Harry’s final assessment of his character is spot-on. 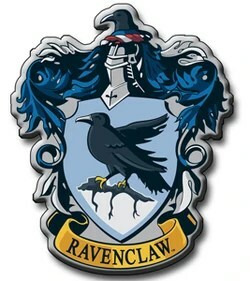 In fact, I would argue that the spilling of Snape’s blood seals his redemption, transforming the surly penitent possibly even into a martyr saint – and if not a saint, then surely one of the holy souls in purgatory… though I doubt Rowling (not being Catholic) would quite agree. Pottermore: Do You Want to Friend Me?